Gosh it’s practically the end of May and summer here in the UK is showing her sunny face. I don’t know about you but I just adore the warmth of sunshine on my old bag of bones and the cool breezes. Especially blowing air to help alleviate my breathing difficulties. Traditionally people say the New Year or Spring time is the most exciting time of year for new opportunities and celebration. Not so for me. You see I believe that now is the most exciting and welcome time of year. The warming sunshine helps to percolate my senses and focus on what is important to me. The warmth of the sun’s rays makes me feel unstoppable, optimistic of changing what needs to be changed within my Circle of Life and totally able and willing to win and certain I’m living life on my terms, by my design because each and every day I’m ‘doing’ something to boost my lifestyle, my health and my wealth. This idea is something anyone with the right tools, strategies and mind set can achieve. So today I decided I ready to do something different and share what is close to my heart, to let others know what keeps me getting up each day to specifically find a way to live life by design and the journey I’m taking to ensure my freedom of choice so the idea of living life by design happens. It’s all about PMA – Positive Mental Attitude. I want to share with you how you too can say out loud “I Live Life by Design”. You see the concept to live life by design is nothing new. People have always been encouraged to set goals to improve their style of habits and be proactive as they go about their daily life. To strive for something better without wasting energy daydreaming and overthinking the ‘what if…’ scenario and procrastinating. For all of us life happens and negative influences can and do creep in forming mental blocks to keep you in place. You know what I mean, how often have you felt a lack of motivation to move forward, to do something towards achieving a goal with a big breakthrough. The fear of failure looms up its ugly head and stops you in your forward moving tracks, taking away your motivation for meaningful action and all hope of achievement that sets you on the road to success in both life and business. Life doesn’t need to be like that a place of paralyzing gloom and dismay. A place where you feel a prisoner to your environment or a victim of circumstance. Life can be on your terms and I know how to put into place practical and sustainable steps that can lead you towards your own success. If you are serious enough to create meaningful change within your lifestyle then NOW is the best time to begin. Begin today by tapping into the step-by-step system that works! Try out the steps, one by one and you'll see change happen. 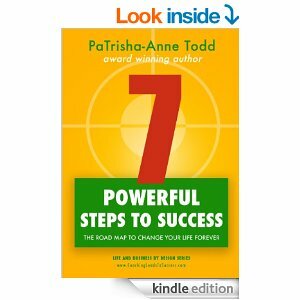 Tap into my book '7 Powerful Steps To Success' and be the one to say "I Live Life by Design". My goal is to do it myself, in other words to purposefully choose what I want to do and not to be dictated to by another. To reach my full potential and effectively create a long term lifestyle I truly desire.